For the novel by Jonathan Kellerman, see Blood Test (novel). A blood test is a laboratory analysis performed on a blood sample that is usually extracted from a vein in the arm using a needle, or via fingerprick. 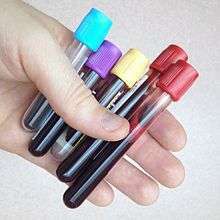 Multiple tests for specific blood components (such as a glucose test or a cholesterol test) are often grouped together into one test panel called a blood panel or blood work. Blood tests are often used in health care to determine physiological and biochemical states, such as disease, mineral content, pharmaceutical drug effectiveness, and organ function. Typical clinical blood panels include a basic metabolic panel or a complete blood count. 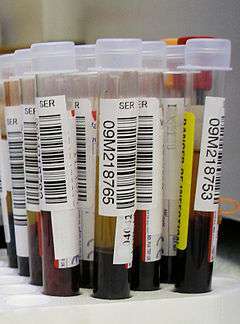 Blood tests are also used in drug tests to detect drug abuse. In some of the United States, a blood test is required before marriage; historically, this was previously true in more states. On 30 October 2015, researchers at the VUMC Cancer Center Amsterdam reported developing a blood test that, from a single drop of blood, can diagnose cancer with a probability of 97%, and about 6-8% probability of a false diagnosis, in healthy patients. Vacutainer tubes used in the collection of blood. During venipuncture, pressure differences between the vein and the vacuum in the Vacutainer forces blood into the tube. Venipuncture is useful as it is a minimally invasive way to obtain cells and extracellular fluid (plasma) from the body for analysis. Blood flows throughout the body, acting as a medium which provides oxygen and nutrients to tissues and carries waste products back to the excretory systems for disposal. Coincidentally, the state of the bloodstream affects, or is affected by, many medical conditions. For these reasons, blood tests are the most commonly performed medical tests. If only a few drops of blood are needed, a fingerstick is performed instead of drawing blood from a vein. Phlebotomists, laboratory practitioners and nurses are those charged with patient blood extraction. However, in special circumstances, and emergency situations, paramedics and physicians sometimes extract blood. Also, respiratory therapists are trained to extract arterial blood to examine arterial blood gases. Samples of human blood collected for testing. The barcodes contain information that is used to identify the individual from whom the sample was taken and the blood test requested. A basic metabolic panel measures sodium, potassium, chloride, bicarbonate, blood urea nitrogen (BUN), magnesium, creatinine, glucose, and sometimes calcium. Tests focusing on cholesterol levels can determine LDL and HDL cholesterol levels, as well as triglyceride levels. Some tests, such as those that measure glucose or a lipid profile, require fasting (or no food consumption) eight to twelve hours prior to the drawing of the blood sample. For the majority of tests, blood is usually obtained from the patient's vein. Other specialized tests, such as the arterial blood gas test, require blood extracted from an artery. Blood gas analysis of arterial blood is primarily used to monitor carbon dioxide and oxygen levels related to pulmonary function, but is also used to measure blood pH and bicarbonate levels for certain metabolic conditions. While the regular glucose test is taken at a certain point in time, the glucose tolerance test involves repeated testing to determine the rate at which glucose is processed by the body. Blood tests results should always be interpreted using the ranges provided by the laboratory that performed the test. Example ranges are shown below. Upon completion of a blood test analysis, patients may receive a report with blood test abbreviations. Examples of common blood test abbreviations are shown below. CRP C-Reactive Protein Level of inflammation with the body. If the immune system is fighting an infection or illness, CRP will be higher. Analysis of 15 different blood test readings to provide information about overall health. TSH Thyroid Stimulating Hormone Thyroid regulates the function of metabolism. Low levels can lead to weight loss, while high levels lead to weight gain. ESR Erythrocyte Sedimentation Rate Indicates the time it takes for red blood cells to move down a tube. This shows signs of inflammation within a body. INR International Normalized Ratio This is a blood clotting test. LFT Liver Function Test This test reveals the levels of waste products, enzymes and proteins that are processed by the liver. U+E Urea and Electrolytes This test is performed to measure the function of kidney. CMP Comprehensive Metabolic Panel This analysis provides an overall picture of the metabolism and chemical balance of the body. WBC White Blood Cell Count The level of white blood cells. RBC Red Blood Cell Count The level of red blood cells. HBC Hemoglobin Level of hemoglobin molecules. HCT Hematocrit Similar to RBC but in percentage. PLT Platelets Platelets levels in the blood. Polymerase chain reaction (DNA). DNA profiling is today possible with even very small quantities of blood: this is commonly used in forensic science, but is now also part of the diagnostic process of many disorders. In 2008, scientists announced that the more cost effective saliva testing could eventually replace some blood tests, as saliva contains 20% of the proteins found in blood. In February 2011, Canadian researchers at the University of Calgary's Schulich School of Engineering announced a microchip for blood tests. Dubbed a microemulsion, a droplet of blood captured inside a layer of another substance. It can control the exact size and spacing of the droplets. The new test could improve the efficiency, accuracy and speed of laboratory tests while also doing it cheaply. The microchip costs $25, whereas the robotic dispensers currently in use cost around $10,000. March 2011: A team of researchers from UC Berkeley, DCU and University of Valparaíso have developed lab-on-a-chip that can diagnose diseases within 10 minutes without the use of external tubing and extra components. It is called Self-powered Integrated Microfluidic Blood Analysis System (SIMBAS). It uses tiny trenches to separate blood cells from plasma (99 percent of blood cells were captured during experiments). Researchers used plastic components, to reduce manufacturing costs. ↑ Best, Myron G; et al. (9 November 2015). "RNA-Seq of Tumor-Educated Platelets Enables Blood-Based Pan-Cancer, Multiclass, and Molecular Pathway Cancer Diagnostics" (PDF). Cancer Cell (journal). 28: 1–11. doi:10.1016/j.ccell.2015.09.018. Retrieved 6 November 2015. 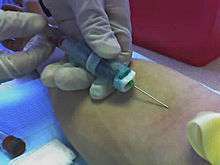 ↑ "Venipuncture - the extraction of blood using a needle and syringe". Retrieved June 21, 2012. ↑ MacLennan CA, van Oosterhout JJ, White SA, Drayson MT, Zijlstra EE, Molyneux ME (July 2007). "Finger-prick blood samples can be used interchangeably with venous samples for CD4 cell counting indicating their potential for use in CD4 rapid tests". AIDS (London, England). 21 (12): 1643–5. doi:10.1097/QAD.0b013e32823bcb03. PMC 2408852 . PMID 17630562. ↑ Aaron SD, Vandemheen KL, Naftel SA, Lewis MJ, Rodger MA (2003). "Topical tetracaine prior to arterial puncture: a randomized, placebo-controlled clinical trial". Respir Med. 97 (11): 1195–1199. doi:10.1016/S0954-6111(03)00226-9. PMID 14635973. ↑ "Michigan careers". Michigan.gov. 2010-01-05. Archived from the original on June 29, 2011. Retrieved 2011-08-09. ↑ Belargo, Kevin. "Cholesterol Levels". Manic EP. Retrieved 17 January 2012. ↑ "Fasting blood samples". NHS UK. Retrieved June 21, 2012. ↑ "Blood gases". NHS UK. Retrieved June 21, 2012. ↑ "Glucose tolerance test". Medline. Retrieved June 21, 2012. ↑ "Blood tests normal ranges". Monthly Prescribing Reference. Retrieved June 21, 2012. ↑ "Appendix B: Some Common Abbreviations". MedlinePlus. U.S. National Library of Medicine. Retrieved 2016-04-16. ↑ "Understanding Blood Tests Online". Lab Tests Portal. Retrieved 2016-04-16. ↑ "Press TV - Saliva test to substitute blood test". Presstv.ir. Retrieved 2011-08-09. ↑ Denny P, Hagen FK, Hardt M, et al. (May 2008). "The proteomes of human parotid and submandibular/sublingual gland salivas collected as the ductal secretions". J. Proteome Res. 7 (5): 1994–2006. doi:10.1021/pr700764j. PMC 2839126 . PMID 18361515. ↑ "Microchip offers faster and cheaper way to test blood". CTV News. Bell Media. 2 February 2011. Retrieved 2 October 2016. ↑ Taylor, Kate (2011-03-18). "Blood analysis chip detects diseases in minutes". Retrieved 2011-03-26. ↑ Dailey, Jessica (2011-03-22). "New SIMBAS Blood Analysis Biochip Can Diagnose Diseases In Minutes". Inhabitat.com. Retrieved 2011-03-26.